I was reading a post on Threads Magazine dot com by Kenneth King today. 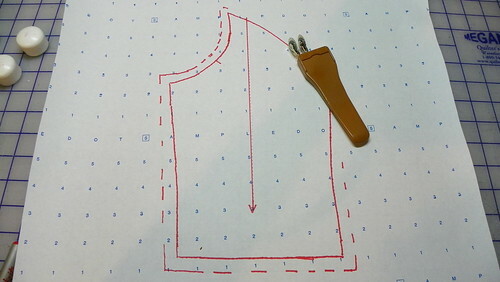 It’s a good one about how to correct the armscye for a very wide and high rounded back, a body shape similar to the figure style for which the Burda Faux Peplum jacket would be perfect. 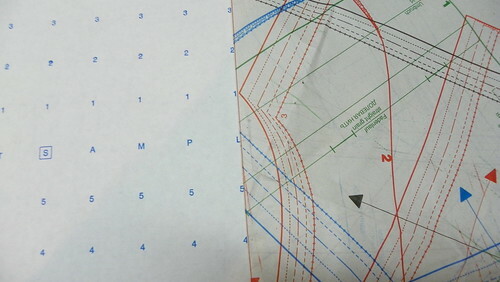 It’s good to know why some things are done in pattern making. I’m not satisfied with, “Oh they drafted that pattern wrong!”, which was my conclusion yesterday. There’s too many shapes under the sun to call my body shape the one all “correct” patterns must fit. Anyway, as I mused I ran into new thoughts. I realized that I had done something new-to-me when I made my paper pattern for that jacket shown yesterday. You will probably find ways to improve this technique to fit your preferences. I used to use translucent paper to trace off the patterns, back when I had The Stitchery in its own house and had a glass table. I’d put a light bulb under the table and turn it into a huge light box. Those days are gone, and so is the table. 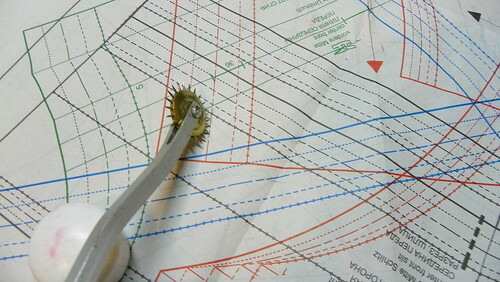 Now I have to trace on a wooden table with a cutting mat on top. These days many things just “happen” and I can’t say exactly why or where the ideas come from. I like to find the approximate placement of the grain line so it’s easier to line up everything with the straight edge of the cutting mat and measure to make sure the fabric is equidistant and therefore on grain. 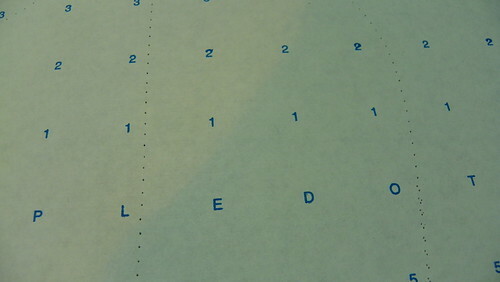 I try to fold back the pattern sheet to get the grain lined up with the numbers on my tracing paper. This is NOT a necessary step, we’ll prick it in anyway. 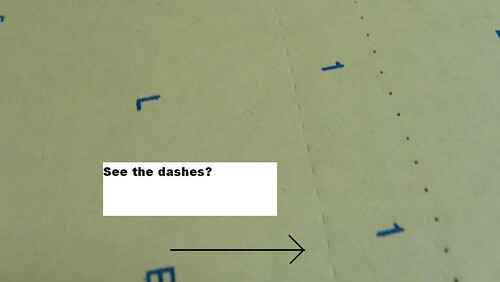 No need for carbon paper. 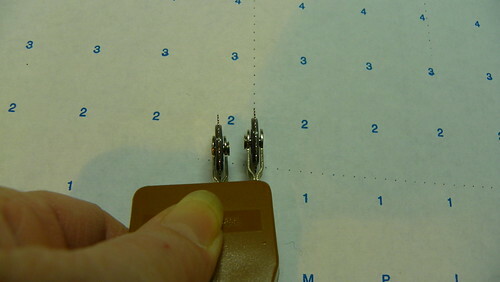 I use a ruler to draw in the grain line, marked by an arrow. And a magic marker to highlight the seam and cutting lines and pattern markings. 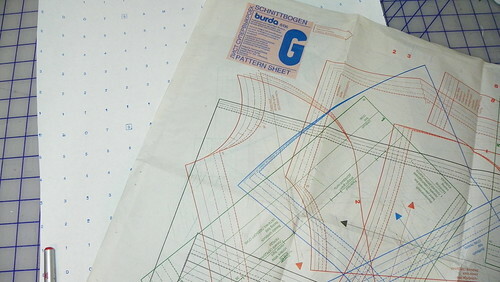 Posted in Burda Patterns, Sewing. Bookmark the permalink. Thanks for the innovative idea! It will get tucked into my techniques-to-remember brain pocket. As for a tracing table, I read this idea years ago: A table that pulls apart for inserting leaves is needed, and a glass window. Pull the table apart, and lay the window on it. At my house, it would be a good idea to wash the window first. Then light a lamp under the window and trace away. These components of a tracing table store themselves, being useful as they do so. That is a great idea, Carol! If you have the room it is worth a try! Wow! That’s the first time I’ve seen this method used. It is very interesting. Thanks for sharing. Interesting idea, but I am all about bodging it!! Wish I had your neat and tidy ways. Thanks for sharing your technique, I have a stiletto tracing wheel… now need to find a double one.